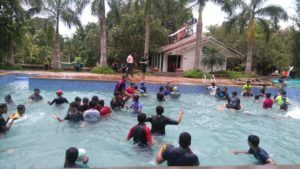 The students’ of Class IX had a memorable picnic to Pandit’s Health Resort and Spa on 29th September 2018. The day started off with the Lourdites assembling in the school grounds. Our Principal Rev. Fr Robert D’souza advised us to be at our best, while having fun. After praying and taking attendance, we boarded the bus and started our journey to Moodbidri. We reached there by 9.00am. The resort staff welcomed us with heart-filled warmth, juice and chocolates! We were then served with delicious breakfast which filled our tummies to the fullest. 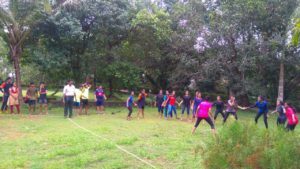 Next, we moved on to the playground where we played a number of games such as football, throw ball, Frisbee etc. 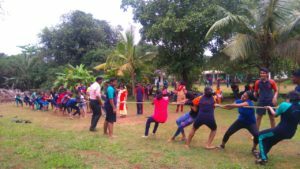 Our teachers also organized a tug of war and a kabbadi competition for all the students. It was competitive as well as great fun. By 11:15am we entered the pool and enjoyed ourselves completely. At 1.00pm lunch was served which had a variety of both veg and non-veg food. We were also served with appetizing desserts like custard, cake, coconut burfi and ice-cream. We began playing in the pool again at about 1.30pm. Our teachers too got involved with us. By 3.00pm it started raining and so we were called indoors. But it didn’t matter to us since our teachers had organized a housie-housie game for us. Four children won prizes and we were also given some light snacks. We then thanked the management for their kind hospitality towards us. After prayer, we came back to the place from where this awesome trip had started with new experiences and beautiful, long-lasting memories. To sum it up, it was one of the best trips that anyone could have wished for!! !